Discussion in 'General RPG Discussion' started by Rhuantavan, Jun 26, 2016. This is Call of Saregnar, a (BaK & RoA-influenced) low-magic story- and exploration-centric RPG that I've been developing for the past couple of years. 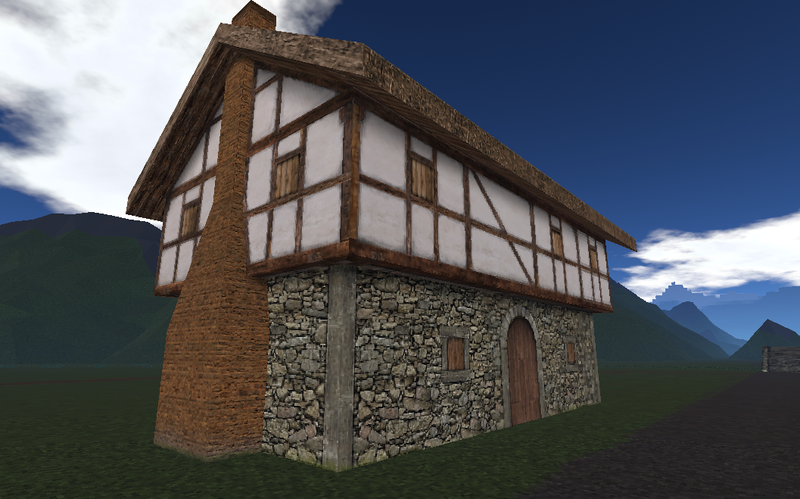 If you want to know more, just hop over to http://www.callofsaregnar.com. If you want to support the development of the game, please check out my development diary on Patreon. 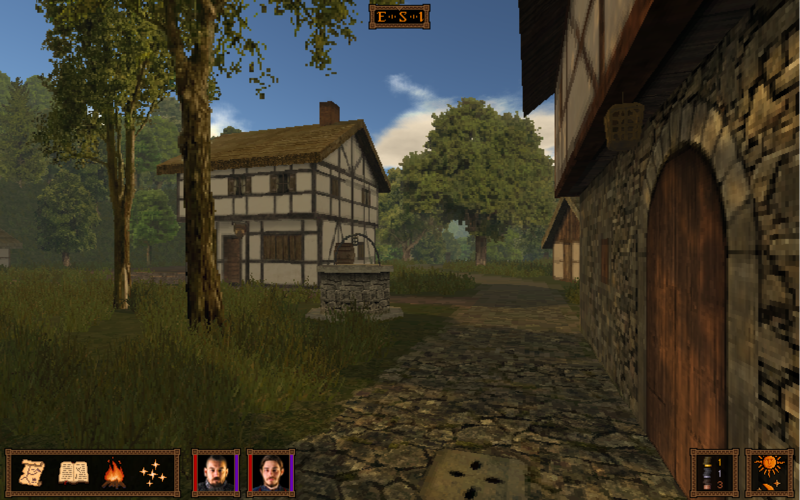 Indie game developer working on Call of Saregnar, an old-school story-centric tactical role-playing game. Find more about it on twitter, FB, and here – on the Codex. Also please consider supporting the game development on my Patreon page! Like I said before, BaK vibes are hella strong with this one. I hope you're making an entity manager, AI, physics, etc together with this. If this is just a renderer and your first project you might find that the way you're made it doesn't fit well for developing the rest of the engine and then you'll cry and abandon it. On the code front I already have a number of subsystems in place: data parsing, lua scripting, world entities management, a conversation system, an inventory/skills/attr system, a rudimentary turn-based combat system, etc. Some of those have to be rewritten or modified since I moved to 3D, but I don't see any forthcoming problems. I like the grafics. Looks propa old school and not asset store garbage. Edit: I'm a liar, the lighting/clouds system is 100% asset store goodness. Daamn, looks good. Like really good. Keep going man. The ground texture appears more pixellated, as in lower res. Maybe I'm nitpicking, but for me it looks like a minor (yet somewhat frustrating) inconsistency. It's not as bad as encountering a small crate with a 2048 texture slapped on it in the game with the target res set to 128 ppu, but still. It is lower res, yes. I did it for saving memory since each tile uses a different texture altogether and tex upon tex it might consume a lot. Still, I am not sure if it does consume so much mem, so I might have them in high res later... gotta study the subject, since I am not very familiar with 3d stuff. Edit: I have doubled the terrain tex size and the memory impact is minimal... what do you know. You can make several large textures which contain 'sets' of unique small textures that can be UV mapped to the tiles and re-used accordingly for tiling and stuff. Re-using the same texture over and over should be somewhat cheaper on the memory, but if you're using too many tiles, I think it can slow things down, and the possible increase of polygons required for this task can also cause problems. 4. You could also add a check to replace the textures with simple color materials if you're too far away from them. Could sacrifice some performance (potentially fixable by making the check occur every once in a while...), but if you're using unique textures, then it could be a nice way to save some memory AND keep the draw distance pretty high. Your night color is perfect, don't change it. Thanks for the info. Like I've said in the edit, the current setup uses little memory anyway. I've tried to have the textures crunched to 50 quality, increased the terrain tiles size to 512px, and the scene above uses only 110.3 MB. I do have the mipmaps on, since without them it is very jarring to the eyes. I have to agree with everyone so far, those early screens look pretty good. 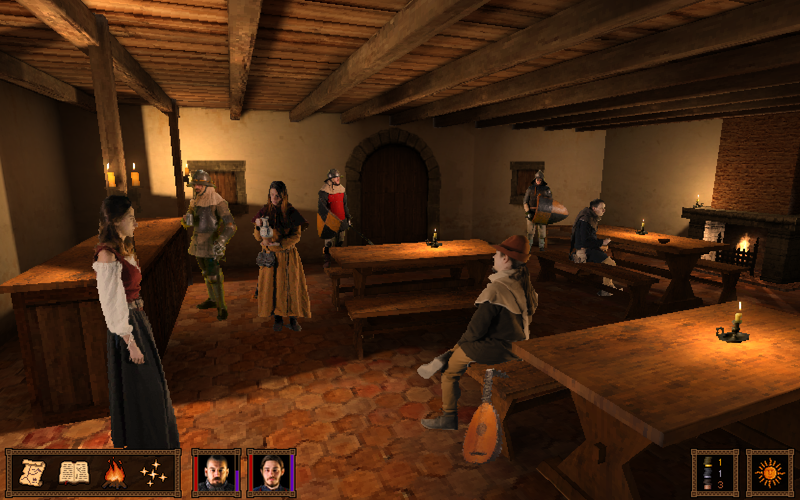 You can still get the Betrayal at Krondor vibes but in a relatively higher resolution. The lighting is also stellar. Let's hope its more than just a pretty face. Thanks! 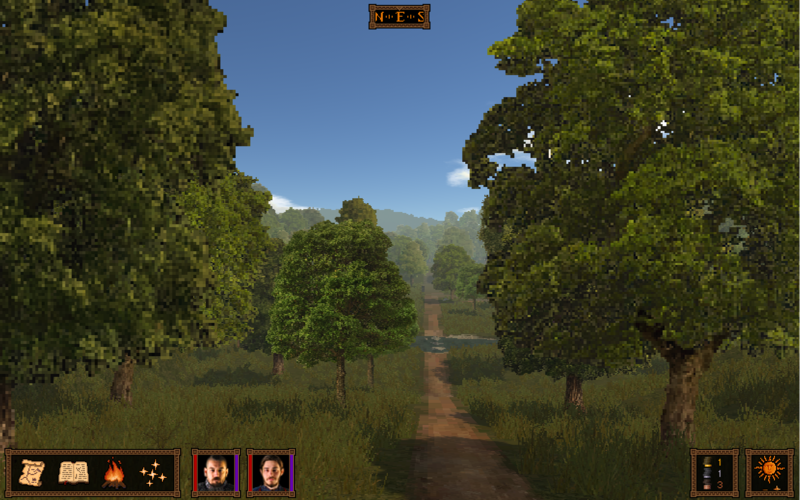 I can only say that I have grand plans for the game: it is my life project after all Don't forget that it started as a glorified text-based rpg, which in my head already had to have other strong features (story, characters, combat, etc), since it had no 3D graphics. Although I had to drop one of the best features (Star Trail-inspired map travel and camping) once I added first-person exploration, I believe the game is just a bit more enjoyable now, as the original lacked exploration mechanics. I can't say if I will finish it in 5, 10 years from now, but I will definitely finish it, since I care for it too much. Did nealiios ever have a look at this? Hopefully we'll all still be alive by then. 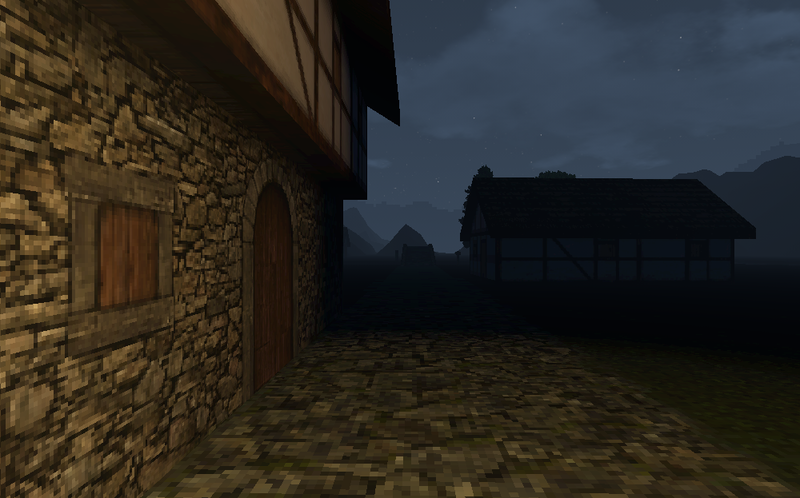 Man, I just love the atmosphere of this night scene. Even with just these few elements, it already feels mysterious and interesting to explore. The low draw distance and fogged-out silhouettes in the distance really add to the effect.